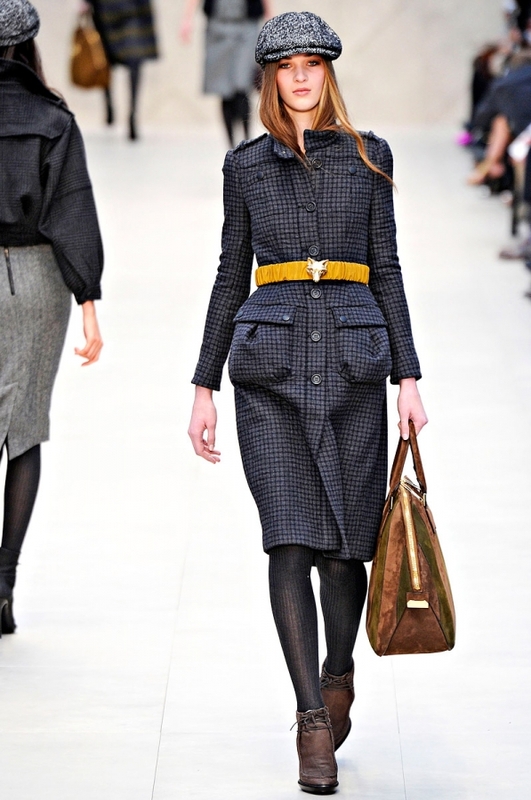 Burberry Prorsum Fall 2012 RTW Collection. 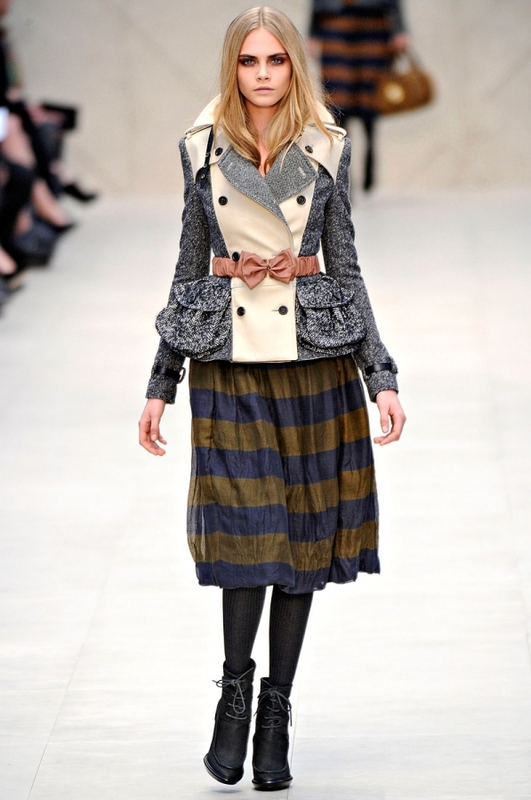 See the fabulous fusion of two clashing style themes, the 'Town and Field' envisioned by Christopher Bailey in the Burberry Prorsum Fall 2012 ready-to-wear collection. 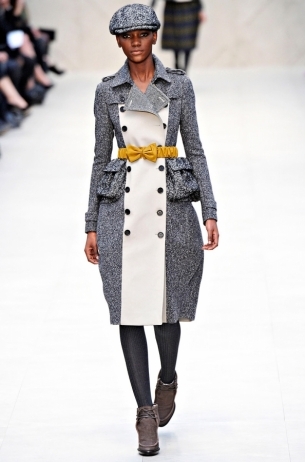 Christopher Bailey knows no limitations when it comes to choosing inspiring themes for series of collections. 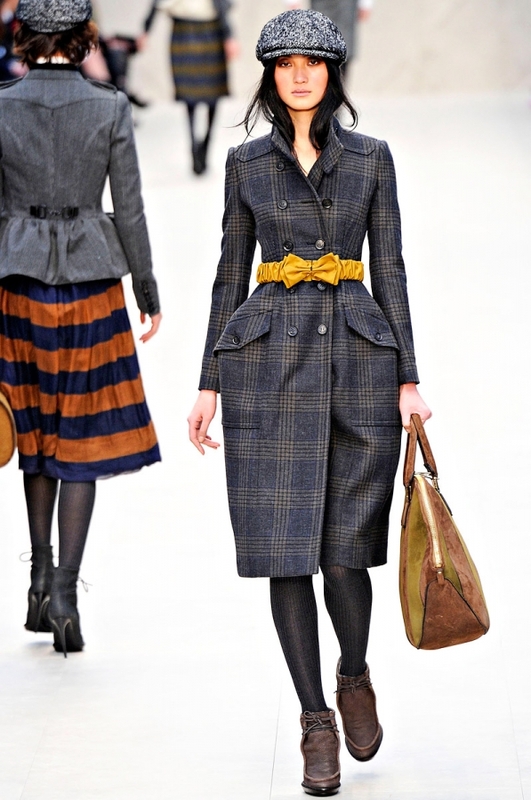 Thanks to his prophetic design fantasies and almost psychic sense to predict the style cravings of the fashion fold, Burberry Prorsum became one of the most influential ateliers of the world. 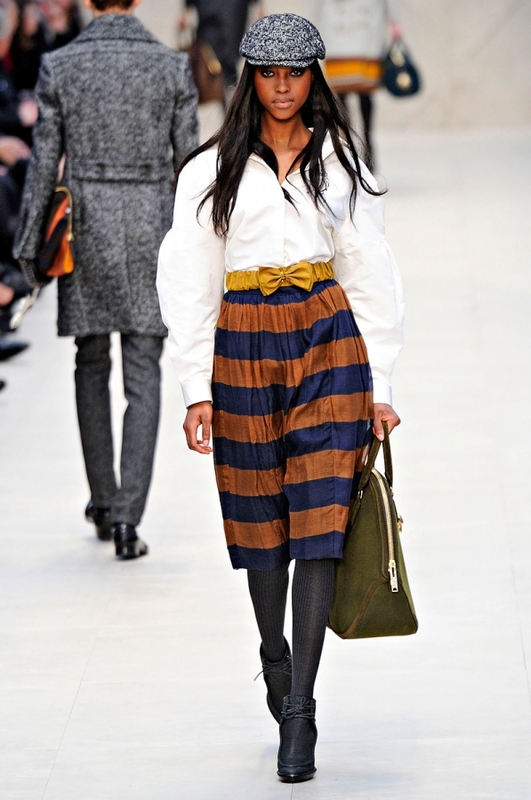 Keeping the public on its toes from one season to another, this young style guru works on magical ensembles which combine Brit chic elements with other aspects of high-street fashion. 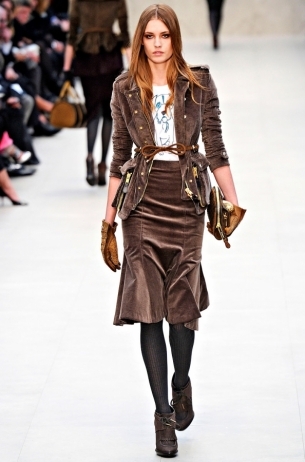 For the Burberry Prorsum Fall 2012 ready-to-wear collection, Mr. Bailey decided to re-elaborate and fuse two different themes. As the title of the style parade illustrates, 'Town and Field', we have an innovative and amazing remix of versatile dress codes. Popularizing the art of layering, the brand offers us the chance to steal a few styling and accessorizing tricks that could save our look from an embarrassing meltdown and monotony during the upcoming rainy season. Creating the perfect balance between the spheres of the 'town' and the 'field', the top designer offered a unique visual experience to the audience and celebs in the front row. In order to break down the collection into its basic pillars, we should definitely focus on the main themes. In the collection, the theme of the 'town' is illustrated by the geometrical precision used to create cropped and sharp outerwear clothing elements. The hottest coats and jackets are armed up with Brit chic prints, faux fur details and tiny bows created of the same fabric like belts which complemented the different ensembles. On the other hand, we also have a rural scene, the 'field' which is present in the form of cotton parkas, animal images (sparrows, dogs and owls) along with cardigans and embroidered shirts. Only a similarly creative and pioneering designer like Cristopher Bailey could fuse these clashing elements into a harmonious composition. Interestingly, the highly-acclaimed couturier is not fond of futuristic design patterns and decides to inject an edgy tint into these classy and elegant ensembles in the form of statement shoulders and unconventional accessorizing options. This is the secret which keeps mainstream fashionistas under Burberry's spell. 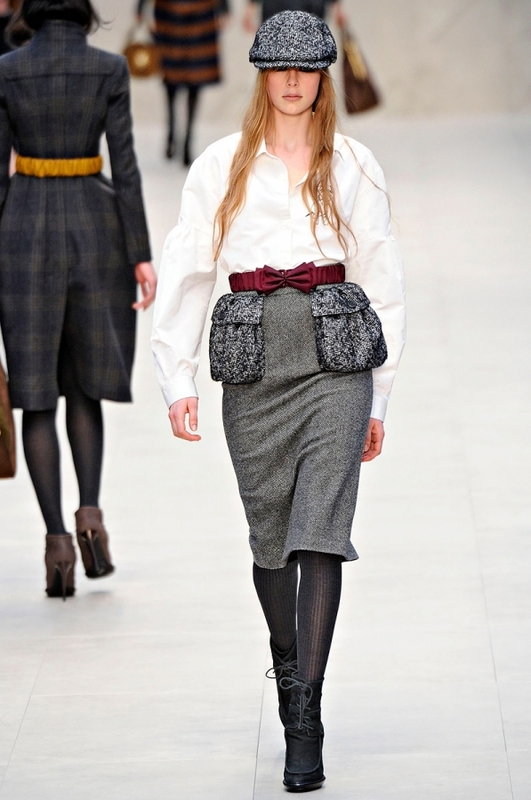 Pastoral chic is also present in the selection of fabulous accessories like urchin caps, ribbon and bow belts together with ultra-flirty Victorian style lace-up ankle boots. Bailey relied on the romantic vibe of floral and artsy prints to inject an'Arcadian couture' effect into classy dresses. Velvet is crowned as the ultimate royal fabric used by the Burberry atelier to get in touch with the sensual side of fashionistas.